When you come to terms with the fact that diets just don’t work, what comes next? Listen to your hunger and fullness! In this episode, Opal Co-Founder and Nutrition Director Julie Church, RDN, CEDRD, CD talks with host Carter Umhau, LMHC about what it looks like to eat from a place of attunement, rather than the rules and structures of one diet or another. 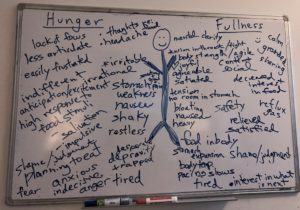 Julie and Carter will walk through how to identify the cues of hunger and fullness, and how attunement in and of itself can ask you to stay an active participant in your relationship to food. “Intuitive Eating” Evelyn Tribole, MS, RDN and Elyse Resch, MS, RDN, CEDRD, Fiaedp, FADA, FAND.